If you’re looking for a versatile new forklift that supports dual fuel options, Lencrow Forklifts has the best range of LPG and Petrol models at competitive prices. 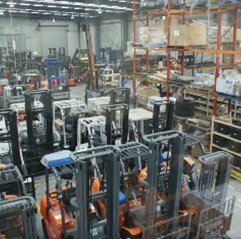 As Australia’s largest and most trusted independent forklift supplier, all of our LPG and Petrol Forklifts are backed with experienced 100% after sale services and support. For those companies that don’t place heavy demands on their forklift and are looking for great value, the UniCarriers Smart series is the ideal forklift. Available in diesel, petrol and LPG, the UniCarriers forklift offers capacities of 1800kg, 2000kg, 2500kg, 3000kg and 3500kg, which are backed by an industry-leading 3 year warranty. The combination of this 3 year warranty and exceptionally low purchase price enables users to have a very cost effective solution to suit most opeartions forklift needs. The Smart Series offers serious 'bang for buck' with outstanding performance and quality standard features particularly around operator comfort and safety. The 1F Series to be environmentally friendly, ergonomic and designed to reduce the cost of running costs in a lifetime of ownership. While the upfront cost of the 1F series is comparable with other leading brands, it is the fuel savings that provide significant cost savings over the life of the forklift. UniCarriers research and developmetn has effectively reduced carbon emissions by incorporating a sophisticated Electronic Controlled System and 3-Way Catalytic muffler in the engine. These two integrations detect the amout of oxygen in the exhaust fumes when combustion occurs and the engine control motor automatically adjusts the performance of the forklift to reduce its carbon emissions. The 1F Series boasts lower emissions, tighter turning circles, improved performance and better fuel economy. The forklifts have a low centre of gravity providing excellent stability and improved safety. The 1F Series is available in capacities starting at 1500kg up to 3600kg and can suit a wide range of applications depending on your operational requirements. With in the series there are different models suitable for indoor use, outdoor use and includes compact versions. We have included standard specifications for each model as a guide. Full details can be found in the free downloadable Nissan brochure or by contacting us on 1300 536 276 or via email by clicking the enquiry button on this page. As part of UniCarriers extensive range of products we can fit your forklift with any attachment to suit your operational requirements. The range of attachments available in the 1F series include side shift, fork positioners, hinged forks, rotating forks, roll clamps, double tyres and many, many more. UniCarriers manufacture 1F5 Series dual fuel internal combustion forklifts availble in capacities ranging from 3500kg up to 5000kg. These forklifts offer varied load centres to offer a wider variety of mid range forklifts and lifting capacities to suit your needs. Features included in the UniCarriers diesel 1F5 forklift in faster lifting speeds, improved maneuverability, enhanced operator comfort, increased safety and durability to withstand tougher working conditions. Please refer to the "Specifications"
The new T8 series from EP is built with EP’s own transmission which is mounted on large rubber suspension arms and is attached to the engine through a drive shaft. The result of the new transmission is extraordinary with virtually zero vibration reverberating through the truck and the overall noise level of the truck is very low. Hydrostatic power steering for ease of use and reduced fatigue for operator. At Lencrow, our expert knowledge and outstanding customer service mean you can trust our team to provide you with the best LPG/Petrol Forklift for your application. Also known as internal combustion forklifts, LPG and Petrol forklifts are commonly used in industrial handling applications. If your lifting needs are on the lighter end of the scale and you’re looking for great value for money, our UniCarriers Smart series are the ideal materials handling solution, available in diesel, petrol and LPG and in capacities of 1800 kg up to 3500 kg. For higher lifting capacities from 3500kg up to 5000 kg, there’s the 1F5 Series of mid-range forklifts and the R Series for LPG-only applications from 1000 kg to 7000 kg. While for the ultimate in value, there’s the 1500 kg to 3600 kg 1F Series of LPG/Petrol forklifts. These cutting-edge models are designed to reduce lifetime running costs and they boast lower emissions, tighter turning circles, improved performance and great fuel economy. Give you the option of gas power when your access to onsite petrol supplies is limited. Can be used indoors as well as out, unlike petrol-only forklifts which produce higher levels of carbon monoxide. Offer great lifting capacities, faster acceleration and high travel speeds. Offer tight turning circles, excellent manoeuvrability and low noise operation levels. Can be used outdoors on all types of terrain. At Lencrow, we have the biggest and most comprehensive range of new, used and rental forklifts anywhere in the country, with a product solution designed for every kind of materials handling application. 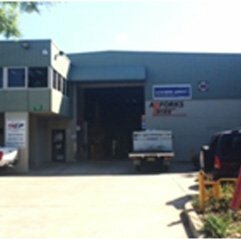 Everything we do is backed by superior after sales service and support and with five branches Australia wide and over 60 dedicated staff, we have the resources to provide our customers with the very best quality, service and value for money. Take our exclusive preventative maintenance programs, for example, where we keep your running costs to a minimum by tailoring a unique servicing plan for your forklift using our computer aided Planned Preventative Maintenance System (PPMS). 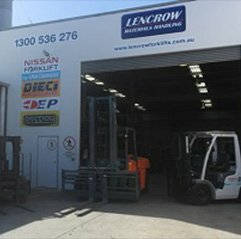 An Australian family owned business with over 40 years experience, Lencrow Forklifts is dedicated to providing Australian businesses with a sustainable and economical future through a total all-in-one materials handling solution. Internal combustion forklifts are available in a huge range of specifications, all tailored for different applications. It’s therefore essential to have your premises evaluated by a trained consultant to ensure any equipment purchased is fit for its purpose. 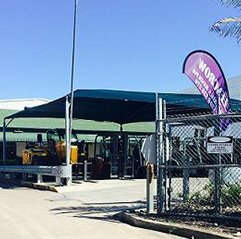 To find out more about any of our LPG/Petrol forklifts, browse our range online, or give one of our expert consultants a call to discuss your materials handling needs on 1300 536 276. You can also contact us anytime by filling in our online enquiry form or by calling into any of our five locations in Sydney, Newcastle, Brisbane, Melbourne and Adelaide.